Local furniture designers RAW Studios expanded its existing Epik range of office furniture – a range of beautifully designed and expertly crafted office furniture developed for commercial clients – for 100% Design Johannesburg 2017. At 100% Design Johannesburg, August 2017, RAW Studios was invited to feature its concept for a new office space and working environment. Using the Autodesk Fusion 360 software package, the team at RAW expanded its existing Epik range to include various designs that illustrate how workspaces can be activated, energised and equipped for meaningful work. A unique aspect to Autodesk Fusion is that it integrates freeform and solid modelling tools, as well as enables 2D modelling and 3D animation and rendering. These features were central to the development of the Epik range as they provide the capability to prototype quickly and refine designs where needs be. The Fusion software package also connects the entire product development process in a cloud-based platform, which allows designers to share, review and manage versions seamlessly, thus speeding up development and refinement processes exponentially. The result was a furniture range that was awarded Best Office Furniture Design 2017 at the 100% Design show. 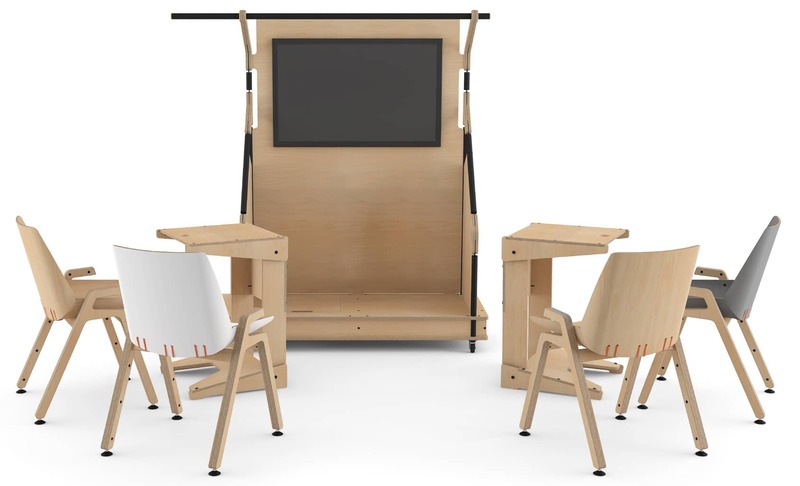 The new products from the Epik range showcased at the 100% Design show address the collaborative and breakaway spaces needed in a workplace where people can use furniture as tools for collaboration, brainstorming, quiet breakaways or private meetings or calls. The design process for these products used to take over a year from product development to launch. Since the introduction of Autodesk Fusion 360 – the ability to develop a design in the morning and produce a prototype by the afternoon – means this production time has been halved, providing obvious advantages to profit margins. For the 100% Design show, the RAW team were able to conceptualise, design and build the expanded Epik range furniture in as little as four months. Thanks to Autodesk Fusion 360, the team at RAW Studios can develop a design in the morning and have a prototype ready by the afternoon. The process begins with the design team identifying the problem to solve or the idea they wish to explore. Then the team models the idea using Autodesk Fusion 360 which allows both free form and solid modelling tools that integrate seamlessly. Once the team decided the best approach to take, thanks to the insights generated from the 3D animation and rendering application, they moved to prototyping some of the complex elements as identified by the simulation software. At this point in the process, the CAM application for turning and milling aides in converting the design to a prototype with 100% accuracy. As the refining and cutting process circles at the last stage on the development lifecycle, the simulation software and CAM application help the team to refine the final product. Design is often driven by its limitations. In the past, traditional tools were unable to activate design advances. Traditional carpentry was challenging in traditional wood materials as they were only available in custom sizes, which wasn’t cost effective – especially when designing non-traditional furniture features. Until the introduction of Autodesk Fusion, designs had been cut on a CNC machine where the limitation was 2D cutting. In practical terms, this meant designs were cut from the top and repositioned for second side cutting. As such, accuracy was compromised, and wastage often occurred. Autodesk Fusion 360 has opened doors to a scope of design that was previously very labour intensive on traditional design, modelling and cutting tools. The cloud-enabled platform enables seamless reviews, sharing and version management. Thus, the ability to set and change parameters is improved. Autodesk Fusion 360 connects the whole development process. Its 3D animation and rendering application along with its simulation software makes whole design process and visualisation much quicker, allowing the team to move straight into machining. The CAM application for turning and milling applications means that designs are taken to the production phase with 100% accuracy, thereby ensuring no errors or inaccuracies in the cutting phase. The tools the software offers enables rapid prototyping, allowing the team to create a design in the morning, and produce a proto-type by the afternoon. The 3D rendering application allows the team to show clients the rendered quality. The accuracy provided by Fusion 360 means the team have realised savings in terms of reduced material costs due to far fewer changes during prototyping, an increase in production thanks to a streamlined design process and the cloud platform integration has enabled the team at RAW to engage effectively in a dynamic business style that accelerated their business growth. Savings achieved through less wastage and increased productivity and accuracy have been realised across the business. “Autodesk Fusion 360 has contributed to the capability of our business in terms of productivity and quality, and it has the potential to do so for many other design businesses. The growth of small design businesses is critical to the growth of the economy in South Africa.” Thys Kotze, RAW Studios.